Mixed Salad Annie: Simple and Satisfying! Sometimes the simplest things are the best. 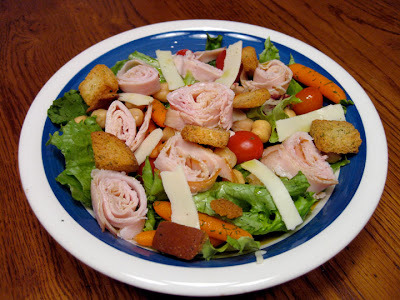 Like this salad for example. Very basic. What did it consist of?? THAT'S IT. Toss it all together in a bowl and call it lunch or dinner. Simple, easy, healthy and so delicious! I do this a good bit for lunch except usually without carrots and cheese and with mushrooms and apples...so good! That is a great chef's salad for lunch. Sometimes simple is best. This looks like my kind of salad! I love all the bright colors from all the ingredients! This salad looks so fresh and wonderful. I LOVE the addition of the rolled up turkey! I could've used this salad for lunch today; I was starving and couldn't figure out anything healthy to eat. This salad would've been the perfect solution--much better than the flimsy egg white scramble I came up with. I love a good salad! I adore chickpeas in salad. Looks good to me! I've been really into main course salads lately. I have a mixed salad green and herb blend I really like. I love simple salads. Looks good! Yaaaay! It's salad season! Looks delicious. m-mmm, lots of new nummies to try. everything sounds so delish! i love main dish salads and am so glad you reminded me to use chickpeas. can't wait for the garden to start producing!